This includes the ease of wrapping the monitor around the crib, placing it on a nearby flat surface, or mounting it on the wall for a precise bird's eye view of the crib. Keeping an eye on your little one is better than ever before. Maximum area coverage with 360 degree pan and 110 degree tilt. Look at the pictures, what you see is what you will get. 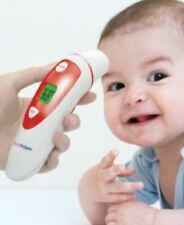 Keep your baby comfortable with the iBaby M2 Pro’s temperature and humidity and get reports right on your smartphone. Free iBaby View app. Tested and works.iBaby Wi-Fi Baby Monitor Wireless Digital Video Night Vision & Music Player - M6. Condition is Used. Shipped with USPS Priority Mail. Please see photos for details and description. Excellent preowned condition. The compact iBaby Monitor M2S Plus, the newest adaptation of the top-rated iBaby M2 Pro, is fully loaded with smart characteristics that promote early childhood education and child safety. And best of all, with the free iBaby Care app parent's can check in on the monitor video feed from anywhere, regardless of their location. $iBaby Care M7 is a smart baby care system that trespasses the boundaries of a conventional baby monitor. Fully equipped with smart features, the iBaby Care M7 promotes early childhood education and improves listening, speaking, vision and breathing skills. Fully equipped with smart features that promote early childhood development that includes age-appropriate educational content, a built-in moonlight soother, music, lullabies, white noises and bedtime stories. And to give parents a peace of mind, the iBaby Care M7 comes enhanced with air quality, temperature, humidity, diaper and feeding alerts. --- 1080p video resolution with night vision --- Compatible with most Apple and Android smartphones and tablets --- Dual band router support (2. W E HAVE DESCRIBED THIS ITEM TO BEST OF OUR KNOWLEDGE INCLUDING ALL KNOWN AND VISIBLE FLAWS. No Exceptions! Opened box!! Tested and work perfectly!! iBaby Wi-Fi Baby Monitor Wireless Digital Video Night Vision & Music Player - M6. Condition is Used. Shipped with USPS Priority Mail. $The iBaby Monitor M6S is a fully equipped smart baby monitor with features created to keep you and your family safe. Fully equipped, the iBaby Monitor M6S comes with a variety of smart features that include music, lullabies, white noises, bedtime stories, temperature and humidity alerts. Our 1080p HD video and audio baby monitor is the ultimate safety device created with your needs in mind. Easily view the monitor’s video feed from anywhere regardless of your location. And best of all, you can invite your loved ones to view the monitor video feed. ---1080p video resolution ---Dual band router support (2.4GHz and 5GHz) ---Basic air quality sensor ---Faster installation speed and video streaming. Open box; includes DVD. Free S/I/H within continental USA only. IBABY WIRELESS BABY MONITORING SYSTEM. CAPTURE AND SHARE HD VIDEOS. PLAY SOOTHING MUSIC. OPENED BOX. Condition is Used. Quick Start Quide. Mountings kit. Power adapter. IBaby Monitor M2S Plus, 1080p Full HD Wi-Fi Digital Video Baby Monitor with Temp & Humidity Detector and Sound and Motion Alerts, iPhone and Android. Item model number: iBaby Monitor M2S Plus. 1080p Crystal Resolun wtioith Zoom, Clear night vision with Near-invisible infrared LEDs let you see your baby clearly even in total darkness. IBaby Monitor M2 Wireless Digital Video Monitor with Night Vision USED IN LIKE NEW CONDITION DISPLAY UNIT. Keep your baby comfortable with the iBaby M2 Pro’s temperature and humidity and get reports right on your smartphone. The newly designed free iBaby app makes it easier than ever to set up mom, dad, grandma, and grandpa as views anywhere. Does not included batteries. AC adapter operated. iBaby Monitor M2S Plus' Crystal clear ight vision and 1080P resolution with Zoom allows you to see your baby even when the light go out Read more Two-way Speakers & Play Lullabies With two-way audio, you and your baby remain close even when you’re away. This would be a great product for helping monitor your little one. IBaby Monitor M2. best prices, always trying to give the. Wherever you are keep your baby close with the M2 Baby Monitor from iBaby Labs. Now parents can take comfort knowing their baby is safe and secure even when they have to be away. Parents can do all. 60 second installation with access on Wi-Fi and 3G/4G/LTE iBaby Monitor M6T brings you both fun and piece of mind. High quality two-way audio with echo cancellation lets you and your little one hear one another clearly. IBaby Care M7 Lite is a smart baby care monitoring system that crosses the boundaries of conventional video and audio monitors. Fully equipped, the iBaby Care M7 Lite promotes early childhood education and a better night's sleep with the newly integrated Wi-Fi speakers and SPA sounds. IBaby Monitor M2 Wireless Digital Video Monitor with Night Vision and Two-way Audio for iPhone and Android. The newly designed free iBaby app makes it easier than ever to set up mom, dad, grandma, and grandpa as viewers anywhere. Does not include batteries. AC adapter operated. Temperature and humidity sensors. Easy to use free iOS and Android Applications are viewable from your PC, iPhone, iPod Touch and iPad. iBaby Monitor M3s Wireless Digital Baby with 360 Rotation, Night Vision and... Shipped with USPS Priority Mail. Lightly used for 1 week. Faults and defects as well as highlights are described. Audio two-way system allows you to hear and speak with your baby without external speaker wherever you are. Bluetooth connectivity fori Pad, iPod, iPhone. Box and manual in 5 languages (GB, FR, IT, ES, DE). IBaby Care M7 is a smart baby care system that crosses the boundaries of a conventional baby monitor. Fully equipped with smart features, it promotes early childhood education through the wide variety of music, stories, and built-in moonlight soother.